Avery Brewing has been around since 1993. The company has built a reputation for quality beers, especially among higher alcohol and extreme brews. In fact more than half of the beers made by the company have 8 percent or greater alcohol by volume levels. Adam Avery and his brewing team get high marks for brews like Hog Heaven Barleywine, The Reverend Quadrupel Ale and Mephistophele's Stout, which is a 17 percent abv winter seasonal. “We’re kind of pigeon holed a bit as making extreme beers, but we make a lot of great session beers,” Avery says. In fact, some of my favorite Avery beers are lower gravity brews full of flavor, like Ellie's Brown Ale, 14'er ESB, Karma Ale and White Rascal Belgian-style White Ale. 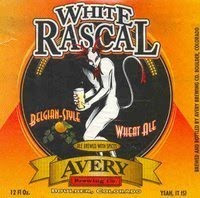 Avery White Rascal is a 5.5 percent alcohol by volume Belgian-style white ale that pours a pale yellow color with a thin white head. The wheat, coriander and orange peel come together nicely in this beer. The citrus and spice flavor notes are perfect for the warmer weather months.